“I am currently taking a class on 5 …what does 5 mean? It’s what are your next 5 years going to look like? What are you going to do with your life in the next 5 years? It’s a perfect class for me because it ties in perfectly with what I want to teach next as a class. The upcoming class is called “Infinite Possibilities” which is the title of a book I read, but that is where most of the similarity ends. 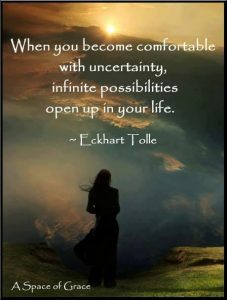 “Infinite Possibilities” has to do with our desire to grow, expand, live our dreams, manifest our desires, walk with and work with the Creator of the Universe in order to have the best life possible. Today is Labor Day, which is sort of a mark of the end of Summer and the push for the close of the year. It’s time to focus now, make plans, set the foundation, and get ready for life to take off in the direction you want it to…are you ready?